‘Tis the most wonderful time of the year. As the UAE embraces the month-long merrymaking, Gulf News tabloid! gets in on the celebrations with these must-see Christmas tree lighting ceremonies, winter carnivals and the festive food, of course. Surround yourself with snowmen and reindeers as you sip on festive beverages at this Christmas tree lighting experience. Listen to the season’s songs while the little ones celebrate with various activities and indulge in a host of sweet treats, hot chocolate, mulled drinks and roasted chestnuts — all on the house. Details: December 5, from 6pm to 7pm at The Village. Free. The customary tree lighting ceremony will start on a high note with the hotel’s own choir performing carols live in the lobby. Guests can enjoy mulled grape, eggnog, cookies and juices while the lights come on. Special goodies and hampers will also be available for purchase. Details: December 6 from 7.30pm. Free. 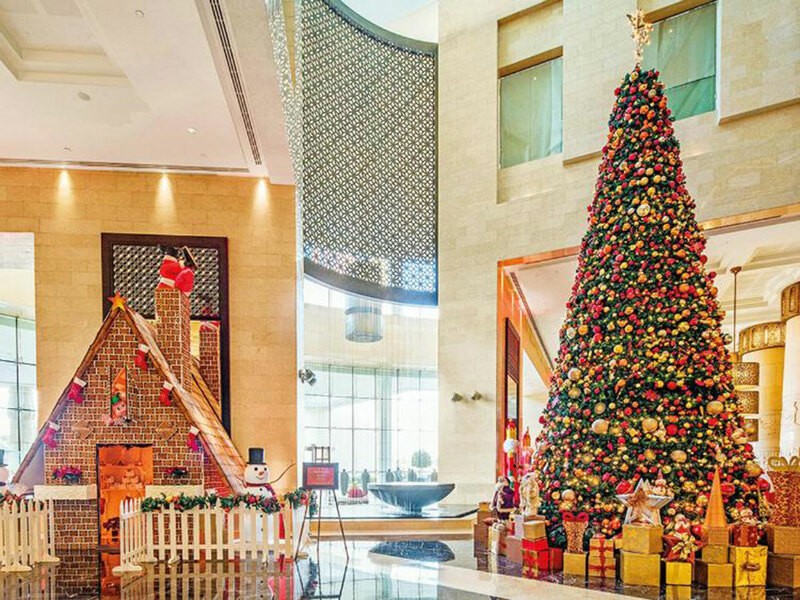 The St Regis Saadiyat Island Resort, Abu Dhabi will host its customary tree lighting ceremony with sweet treats, mulled drinks, cookies, mince pies and juices passed around. Also on the agenda are Christmas carols sung live and a special visit from Father Christmas. The Drawing Room cafe will host a festive-themed afternoon tea featuring seasonal delicacies and a selection of teas. Details: December 6 at 6.30pm for the tree lighting. The Drawing Room tea is between 2pm and 6pm, priced at Dh195. Welcome the Christmas spirit with the hotel’s tree lighting ceremony in the lobby, accompanied by a choir, as well as a festive market. Giving guests the feel of a European Christmas market, the hotel will have a number of stalls set up in the lobby that will offer visitors homemade specials such as whole roast turkey with trimmings, glazed chestnuts and the famed Hilton cranberry sauce. The hotel’s pastry chefs have also worked on creating everybody’s favourite festive-shaped chocolate goodies, gingerbread cookies, puddings, cakes, yule logs, truffles and macarons. Details: December 7, from 6pm onwards. Free. Spread the holiday cheer with the tree lighting ceremony. Guests can enjoy festive treats and sing along to their favourite carols performed by the Heartist’s Choir. Santa Claus will drop in to surprise the kids, while mum and dad can take festive goodies home available at Le Cafe’s Gingerbread House. Details: December 9, from 6pm. Free. Yas Island will transform into a winter wonderland for Yas Winter Carnival. There will be a daily tree lighting ceremony at 7pm, followed by a funfair, carnival rides, festive treats and a firework extravaganza. The venue will have non-stop live entertainment, flakes falling on the hour with a kid’s play zone with real snow and a winter market. Local talent Lucy Hunter James will also take to the stage to sing songs from classic Disney movies including Let it Go, A Whole New World and more. But what’s a Christmas carnival without festive treats? Decorate personalised gingerbread cookies. Separately, large open fire pits will serve up BBQ delights, ice creams and the smell of wonder waffle and crepes. Details: December 11 until 15 at Gateway Park South, Yas Island. Free entry. Register on its website for passes. Daily from 4pm to 10pm and 11pm over the weekend. Tree lighting daily at 7pm. Fireworks every night at 9pm. The tree lighting ceremony kicks off with a gingerbread factory where children are invited to decorate their own gingerbread houses and enjoy festive snacks and refreshments. Adding to the excitement, Santa Claus will meet each child to make note of their Christmas wishes and surprise the guests with a gift. This will be followed by the tree lighting ceremony, accompanied by joyful carols. The complimentary festive treats will be delighting the guests throughout the evening, including the traditional Christmas yule log. Details: December 12, from 4pm for the gingerbread factory. At Dh125 per child. From 6pm is the tree lighting, which is complimentary. Deck the halls with boughs of holly with this festive tree lighting night. Santa will make an appearance, handing out gifts to kids and a choir will sing carols in the lobby, while array of complimentary drinks and treats are on offer. Think mince pies and mulled drinks. Details: December 5, from 5pm until 8pm. Free. Start the joyous season with this wish tree lighting ceremony. Head down to the Swim & Tonic lounge for Christmas carols by the German School Choir and food stalls. Guests can also look forward to real snow falling throughout the evening. Details: December 5, from 6pm onwards. Free. The hotel’s annual community Christmas tree lighting ceremony returns hosted by UAE radio personality Big Rossi, where you can also expect live carol singing, complimentary festive treats and soft beverages, ginger bread making for kids — or adults can choose to indulge in mulled drinks, hot chocolate or eggnog at Mashrabiya lounge. Santa and his musical grotto will also be there for family festive photos with the big man himself. Details: December 5, from 5pm until 7pm. Free. Guests can attend the hotel’s Christmas tree lighting ceremony for free. The event will be complemented with a traditional choir, canapes and themed refreshments, whilst the festive lobby will be decorated with holiday-inspired arrangements. Details: December 5 from 6pm until 7pm. Free. Bring your nearest and dearest to watch the tree lighting ceremony in the hotel’s lobby, coupled with carol singers, along with mince pies and mulled beverages to sample. Keep an eye out for Santa who will be making an appearance and handing out gifts for all little sprouts. Details: December 5, between 5pm and 7pm. Free. Santa Claus and his elves will arrive at Dubai Festival City Mall for a festive market. The tree lighting will take place on December 6 when Santa and his elves arrive at 6pm at the Dubai Festival City Mall helipad. A larger-than-life Christmas tree, visible all the way from Business Bay Bridge, will be lit up at the official tree lighting ceremony, followed by holiday caroling and festive-themed Imagine shows. Details: December 6, at Festival Bay. Free entry, from 5.30pm. The annual 20-foot Christmas tree lighting ceremony will see guests mingle and nibble on festive treats, sip on warm mulled grape and sing along with the Christmas choir as Santa Claus makes a special appearance with a sack brimming full of gifts for the little ones. The doors also open for the giant gingerbread house, full of freshly baked treats and gifts to purchase. Details: December 6, from 6pm to 7pm. Free. The Ritz-Carlton, Dubai International Financial Centre kickstarts the season with a tree lighting ceremony where you can feel the holiday spirit with the lighting of the grand tree and floating garden tunnel. A choir, festive treats and Santa Claus making an appearance. Details: December 6. From 6pm at the Lobby Lounge. Free entry. This festive season, Royal Central Hotel The Palm is celebrating the season with festive menus and dazzling entertainment. Get in to the spirit of the holiday season at the Christmas lighting ceremony with a sing along with carolers as Santa Claus pays a surprise visit with goodie bags for little ones. A traditional gingerbread house on display along with selection of yule logs, mince pies, cookies, candies, more. Details: December 12, from 6pm onwards. Free. Escape Dubai and immerse into a slightly different festive experience at this Al Hajar mountain retreat. Tree lighting will take place on the hotel lawn with Christmas carolers, along with treats to include hot chocolate and mulled drinks. Details: December 13 from 7pm. Free. Enjoy an eve of festive merriment with Christmas carolers setting the scene for the tree lighting. A winter wonderland will be created for guests to enjoy where kids can ride the Polar Bear Express while indulging in a number of festive treats. Details: December 13, at Palmito Garden, from 6pm. Free. Tuck into the hotel’s Wonderland Brunch ahead of its Christmas tree lighting ceremony. Featuring a full roast and additional trimmings, along with a special Santa’s grotto and a live Christmas band at the Lido restaurant. The Christmas lights switch-on will take place on the Pavilion terrace with a choir performance and a visit from Santa and all of the Christmas Cracker characters, along with a selection of nibbles from the mini-Christmas market. Details: December 14. Brunch from 1pm until 4pm, starting at Dh225. Tree lighting between 6pm and 7.30pm. Free. To kick off the festive season, Waldorf Astoria Ras Al Khaimah will host a traditional tree lighting ceremony at the Peacock Alley. Guests can enjoy carol singers and Yuletide treats such as mince pies, hot chocolate and gingerbread men freshly prepared. The jolly man in a red suit will also pay a visit for a special photo session with the kids. Details: December 6, from 4pm until 7pm. Free.